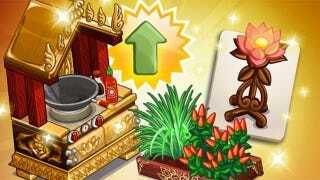 The Thailand event in ChefVille has expanded this week, with players asked to upgrade their Terrific Thai Station and Thai Gardens to unlock a new series of Thai dishes. There are three new quests to complete in Madeline's "Jed-Thai Master' series, and we're here with a look at how to finish them off, thanks to Zynga. The Spider Strainers are earned by posting a general request to your news feed. Meanwhile, the two dishes in this event can only be prepared after you've upgraded to the Intermediate level. The upgrade itself is quite the undertaking, as it requires five different sets of items to complete. You'll need six Perfect Peppers, six Charming Chopsticks, six Wondrous Woks, six Sensational Sharpeners, and six Greater Coconut Graters to finish the upgrade. The Perfect Peppers, Wondrous Woks, and Greater Coconut Graters are all earned by posting general news items to your wall, while the other two sets of items are earned by sending out individual requests to your neighbors. Hopefully, you still have your Rice Paddy Planters from the game's previous Sushi events, as you'll need to tend them once every 12 minutes to complete this task. You can have more than one active Rice Paddy Planter in your restaurant at the same time, so keep that in mind as well. The Thai Garden is tended once every five minutes, and you can upgrade it to include additional ingredients using six Umami Garden Sculptures, six Nutrition Garden Sculptures, and six Beauty Garden Sculptures. The Nutrition Garden Sculptures are earned by sending out individual requests to your friends, while the other two sets of items are earned by posting general news items to your wall. These quests will only be available for the next seven days. What do you think of this upgrade to the Terrific Thai Station? Do you think you'll be able to finish these quests before they expire in a week? Sound off in the Games.com comments!